Following Microsoft's super-stuffed if a little try-hard show on Monday, it was up to Sony to react with its own treasure chest of leaked and still surprise hits. Unlike the big M, Sony chose to eschew any new console announcements in favour of games, games, games and more games. In fact, there was an odd air of disconnection from the Japanese firm as trailer after trailer was wheeled out. Easily one of the best kept secrets on the Sony stage, the return of God of War is a wonderful thing to behold. The series has taken a bit of change in direction, with Kratos now living in seclusion in the land of Norse mythology (because hey, when you've killed all the Greek gods, why not enter a different mythos) with a new, magical axe, a lumberjack beard and son to keep him company. Yup, Kratos has gone full parental in God of War. We get to see he and the little sprog hunting a giant elk in a section that was more than a little reminiscent of The Last of Us, before things get down and dirty with a one on one fight with a mean looking ogre. There are plenty of classic elements missing at first glance - no Blades or Chaos or screen-filling bosses to climb for instance - but we wouldn't be surprised to see a more emotionally resonant story that taps into all those things that made the original GoW trilogy so great. Horizon: Zero Dawn, easily the strongest exclusive title Sony has in development, continued to impress with a slick extended gameplay demo that showed main character and bow-weilding huntress Aloy heading out into a beautiful wilderness that looked as impressive anything The Witcher 3 has to offer. We see her taking on a variety of robotic creatures, with the concept of normal and corrupted (typified by their red glow and aggressive behaviour) thrown into the mix. 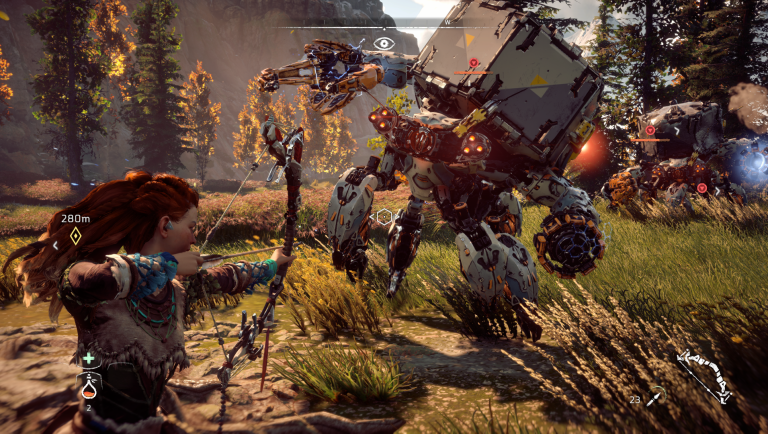 Aloy can use her hunters instincts to identify weak points on each enemy beast, including elements that can be used for parts and upgrades. There's even the ability to turn some robo beast into mounts, if you can pin them down long enough to rewire them. This opens up the world to vaster exploration, as well as the option to fire your bow while still mounted. Very exciting stuff. There was only a tiny demo of Fumito Ueda's long gestating curio, but that cameo appearance wasn't for naught with Sony taking the time to confirm the seemingly impossible - an actual release date for TLG. And it's this year, of all years! Yes, The Last Guardian is going to be finished and you're going to be able to play it on 25 October. Be still our beating hearts, Sony. No one was really expecting a new Resident Evil game quite yet (what with so many spin-offs seemingly floating about at once), least of all one that drops the classic third-person zombie antics of recent games of something far more akin with modern horror tastes. Yes, Resident Evil 7 is going first-person with a potent atmosphere that takes the shocks of that Kitchen VR demo and smothers it in PT and Silent Hills nightmares. It's also coming to PlayStation VR when the game drops on 24 January 2017 - and with plenty of mannequins, creepy figures moving the background and other things clearly lurking in the shadows, inhabiting this world in VR could be enough to make you scream like a newborn. Honestly, we can't wait to give a potentially re-energised Resi a go. Sony didn't announce, or even tease, any new console iterations and there was neither sight nor sound of Sony's plucky yet ultimately abandoned handheld PlayStation Vita - instead, we had Sony jump straight to the point. PlayStation VR will drop on 13 October this year at the price of $399/£349.99. You can pre-order one now with Sony also showing off the PS VR Aim Contoller - a peripheral that turns your PS Move controller into a gun for use with VR shooters such as sci-fi romp Farpoint. We also got a look at some of the 50 games currently in development for the platform, including the aforementioned Farpoint, a Star Wars Battlefront X-Wing VR Mission, a Batman Arkham VR game, a Final Fantasy XV mission and more. It's nice to see some familiar franchises jumping on the bandwagon, but we're more interested in those titles built for VR from the ground up. Sony also showed off the new game from Bend Studio (the dev that made the excellent PS Vita title Uncharted: Golden Abyss), an ambitious open-world gripped by a savage zombie apocalypse. Okay, they're not actually zombies - these Freakers have more akin with the rage monsters from 28 Days Later and swamp you in swarms like the World War Z film. It's actually kind of breathtaking in a very messed up way. Bend Studio are clearly trying to tell a road story akin to The Last of Us, with a huge Pacific Northwest setting and plenty of post-apocalyptic beards to keep those cold winter nights at bay. Sony clearly has a lot of faith in this surprise announcement - it showed off the new IP twice and even closed the show with a heart-stopping fight against a Horde of hundreds of Freakers. Well, there's a headline guarunteed to turn the heads of many a reader. Yes, Hideo Kojima - he of MGS game - took to the stage to personally introduce his new Sony-funded PS4-exclusive - Death Stranding. It's peak Kojima - a naked, tattooed Norman Reedus (complete with Daryll hair) wakes up, hugs a newborn baby then cries oil. So we have no idea what the hell it is, but it's Kojima game so it will no doubt be obtusely brilliant in the way a game orchestrated by the great man can be. No news on when it's out, as it's probably early in development but still, it's great to see Hideo back in games development so soon. Crash Bandicoot is making a comeback of sorts. Sony has greenlit a remastering of the first three Crash games from the PS1 era (Crash Bandicoot, Crash 2: Cortex Strikes Back, Crash 3: Warped) for PS1. That's one helluva jump in terms of generations so expect more than a simple graphical upgrade. Crash will also feature in this year's Skylanders instalment, Imaginators, with his own limited edition model.